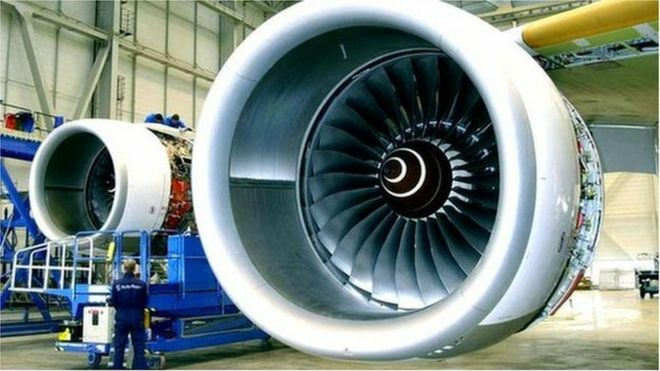 Rolls-Royce has secured more than 7,000 jobs in the East Midlands after announcing its biggest single investment in the UK for over a decade. The engineering giant said it would be investing the majority of the £150m in a new test bed in Derby. This facility would test large civil aero-engines creating up to 200 jobs. There will be no compulsory redundancies in Derby, or Hucknall and Annesley in Nottinghamshire - safeguarding 7,000 jobs for five years. Rolls-Royce has further axed plans to close a precision machining facility in Derby, which would save about 150 jobs. Simon Hemmings, from the Unite union, said the deal was "a once in a generation type of investment and a big commitment to the UK". "It's about keeping jobs in Derby for 25 years plus and we are hoping it will bring hundreds of millions of pounds to the city," he added. "We are so proud, it's brilliant news." Eric Schulz, president of civil aerospace at Rolls-Royce, said: "This investment comes at a time of unprecedented growth in Rolls-Royce. "We are doubling the production of new engines at the same time as introducing three new engines to the market." Business Secretary, Greg Clark MP, said: "The UK and Rolls-Royce are known throughout the world as pioneers of advanced engineering technology. "I welcome the confidence the company is showing in the UK."